Is somebody in your circle of family and friends a hoarder? It may concern you and you may wish to help. Here are some useful thoughts and pointers on the matter adapted from Dr. Catherine Ayers at the San Andreas Stein Institute for Research on Aging, California. Many people think they have hoarding symptoms, but it’s not just a room you’ve messed up over a week. It’s not just lots of items, or an ultra-tidy person declaring a room looks cluttered. 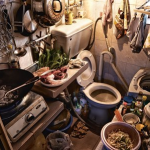 It’s hoarding when a person is effectively unable to use their living space properly, because through-ways are all blocked with objects, usually to ceiling height. It’s a condition, a disorder; a combination of personal history (including family history) and some learned behaviours. If you grow up with hoarding behaviour taking place, you’ll probably learn that it’s normal. There’s an increased likelihood of it afflicting older people. It’s linked strongly to genetics. If a close relative hoards, you’re much more likely to. We also know that the brain functions slightly differently from hoarders to non-hoarders. They have strong beliefs about their possessions plus strong emotions and emotional attachments to them. 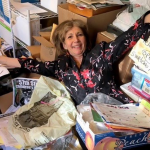 Hoarders suffer huge distress when they have to deal with their items, leading to constant, ongoing conditions of saving items and an inability to throw things out. 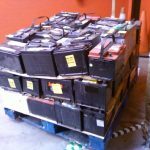 People commonly report, “It just doesn’t feel right, I can’t throw it out, I’d feel terrible getting rid of it.” Without really knowing why, it creates distress. The most common justification is that of wastefulness. Many hoarders see beauty in everything, so that pen cap, empty food container or piece of shell is an amazing object that should be kept. We may all do this sometimes, logically or not – it’s a question of degree. People who are hoarders have persistent, inflexible feelings around being asked to throw out any possessions, even when they have several replacements for them. It causes such distress to the hoarder that people don’t appreciate their emotions around the objects. Hoarders avoid wasting something that could be reused: clothing as rags, for example. The object may have emotional significance, such as a newspaper from when the family was happy. Paper is the biggest problem, as it holds lots of information. Rather than having to face the fear of losing that, people will keep it. Some hoarders are indecisive about everyday choices. Depression often accompanies the condition, as everybody feels shame if they can’t invite family members in. When they do have people in, the hoarding is seen, so they are condemned either way. Executive functioning is often weak in hoarders. Problem-solving, flexible and abstract thinking, procedural understanding; all are low. Their schedules are skewed – they experience overall disorganisation. Hoarding affects a lot of people, not just the family and other social support. Often these relationships are very complicated and sometimes strained. Hoarding will compound all that. More difficulties come with limited or fixed incomes, multiple medications and help providers, plus fire risk. Discussing their ‘case’ with others without their consent will break the hard-earned trust you have built up. Sending in a team to throw stuff out doesn’t help, as it will be there again in a year. It’s not addressing the cause. If you do find yourself trying to persuade, tell them how this will benefit them, and leave it at that – more space, the feeling of well-being and so on. A ‘good telling off’ only harbours resentment, as every schoolkid knows! Instead, think of ideas such as having them photograph or scan documents with you and helping to store them electronically. Likewise, scanning old photos into electronic storage can work wonders. Show them your paperless office with it all stored – the beauty is, you tell them, the images hardly ever have to be printed off! Given time, this photographic solution might also work with some of the three-dimensional, physical objects which they have hoarded long term – the attachment may turn out to have been entirely emotional. 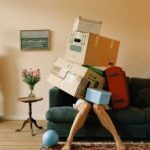 If that doesn’t help them actually discard the item, they might then think of renting a self-storage unit for objects (including photos) they can’t quite bring themselves to let go of just yet – a halfway house. Watch them relax after you’ve cleared valuable space at their home! Just as scans and images will be available for them to relate to on devices any time, they can visit their physical objects in self-storage around the clock too. They will find this very reassuring. The next article will give you more ways you can help – a brief look at some clinical approaches, and a longer focus on your being with them in the middle of their hoard.